This post will show you how to get a list of users logged on a list of servers (or a specific server) and how to format the output in order to work with it, in Powershell. Specifically, we will leverage quser, let’s see a quick example on how to query the current user sessions on a remote server. The above command, will look like this. This is just text however. If we were to assign that result into a variable (with Invoke-Command for instance), it’ll still be unmanageable. We can work with -Replace and with ConvertFrom-Csv in order to get this output to look decent. 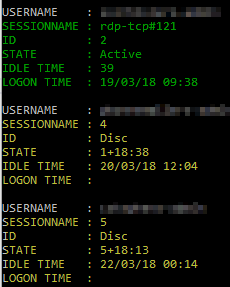 Just for the sake of showing every step, the code below will first grab the list of sessions on a remote server and then use the -Replace and the ConvertFrom-Csv. We’re not out of the woods yet, but here’s how the output looks like now. I’ve added some color to show you what the problem is at the minute. The output in green is good and it’ll always be good as long as the session is Active. The ones in yellow though have their values shifted up. That’s because SESSIONNAME doesn’t exist and so converting it to CSV shifted all values up. In this article, we will go through building a runbook with Powershell and Telegram to allow us to interact with the script with just a message. If you haven’t read it yet, have a look at Automating Telegram Messages with Powershell – In there, I build a simple script that helps me interact with users members of a Telegram group. 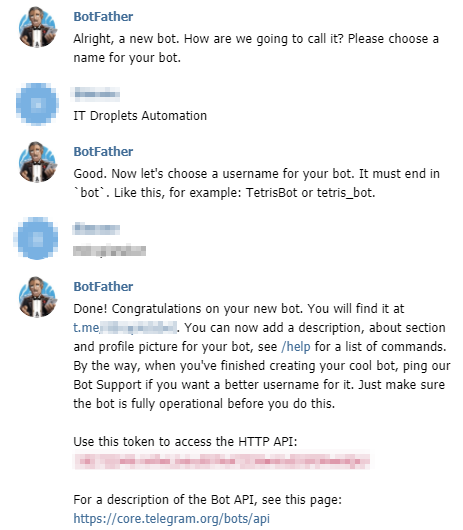 That article has the core of what I’m about to show you now and will also explain how to get a Telegram Bot setup. Check for any new Message in the Telegram conversation, in a loop. Note: To be safe, when the script starts up, it’ll ignore the last message sent, and will be listening for any new message right after that. To perform this, I used the Message Timestamp that is in Telegram’s json ($LastMessage.message.date). If a new Message has been received, check with a Switch if the message contains either “run *” and “quit_script”. 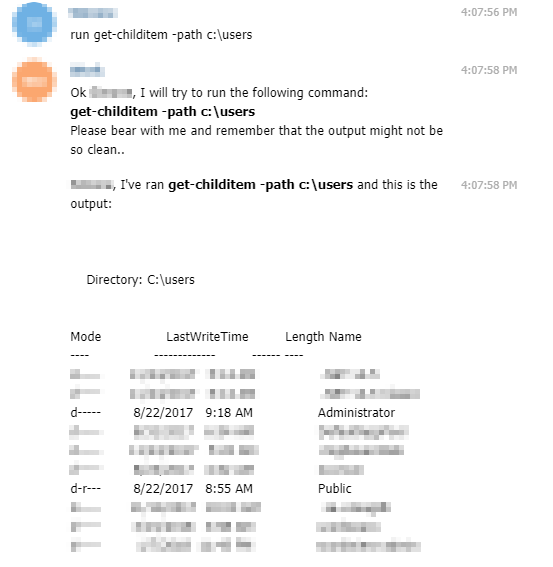 If it contains “run *” (example: run Get-ChildItem -Path C:\), it’ll split the string received and run the command in powershell. If the message is “quit_script”, it’ll exit the script running on the computer. If it doesn’t contain anything like that (example: Hello), it’ll tell the user that the script doesn’t understand that command. How to create a Powershell Web Application? 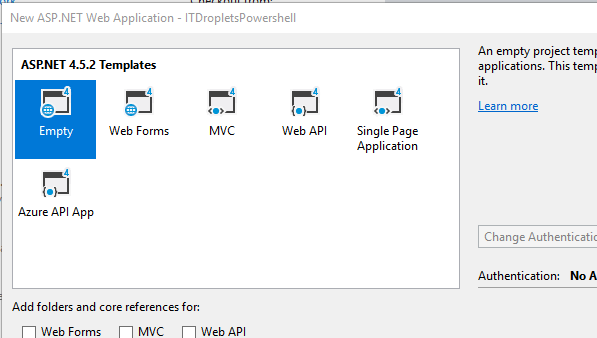 This article will give you some guidelines on how to deploy a very simple web application that leverages Powershell and if you follow it completely, you’ll be able to have a fully functional web application. This is a very important instrument, especially when our goal is to automate as much as possible the environment and repetitive tasks or offload a 2nd or 3rd level task to a 1st level representative. You could build a web application to check permissions for a specific shared folder (I’ve done that successfully) or you could deploy an app that would check the current top 10 RAM processes being used on a remote server (super handy to hand off to a 1st level support team who many have no access to the server) and so on. Please see the final notes at the end of this article. You will need Visual Studio to follow this. 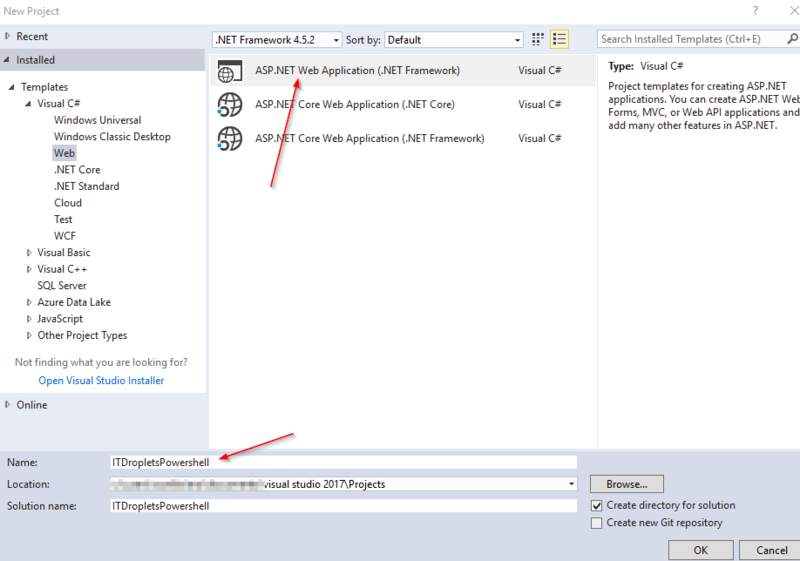 Select Installed > Templates > Visual C# > Web and click ASP .NET Web Application (.NET Framework). Give it a name (ITDropletsPowershell in the example). Since we want to start with a clean solution, let’s select “Empty” and click OK.
Searching a GPO for a specific setting with Powershell is a pretty simple task to perform and it’s really handy when you need to go through a ton of policies or domains in the forest. The script I’ll propose below is very basic and will only require you to input the Domain and the string you want to be searching. You must be able to have enough permission to access all GPOs in the environment. Searching in a domain where you can only see a part of GPOs is sort of useless as the setting you’re after might not be visible with your rights. Perhaps this is good enough for you. You must have the Group Policy Management feature installed. Turn Windows features on or off >> Remote Server Administration Tools >> Feature Administration Tools >>Group Policy Management Tools. Enable the Group Policy Management feature. This is not a prerequisite, but I strongly suggest you to run this from a machine as close as possible to a Domain Controller. In a large environment it’ll take a long time to run, if ran on a slow link. Searching a GPO for a specific setting with Powershell – The script. In the example below, I’m searching for “Windows Defender Firewall” for the domain idroplets.com. $String = "Windows Defender Firewall"
If you want to use this on your one, modify the first two lines by adding the domain and the string you want to look for. After the first two variables to be input by the user, the script will try to get the nearest Domain Controller from where the its being executed. This is extremely handy to avoid to go to talk to a Domain Controller on a slower network. It then gets a list of all GPOs in the domain and sort them by their DisplayName. This is important as the script will then go through them all alphabetically and you’ll can see them as they’re displayed in the GUI without going crazy. For each GPO found, the script will get a report for it and will finally try to match the string you’re looking for. If it’s found, it’ll write down, in green, that the GPO has been found and will return more info such as the GPO ID and its Status.